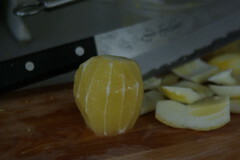 ZESTING LEMONS: First, I cannot stress how important it is to use a microplane or some ergonomically-friendly item to zest 3 dozen lemons. I was up until 2AM zesting, supreming and sectioning lemons. This morning, I remembered I had bought a microplane - it was hanging on my baker's rack, laughing at me. unrefined cane sugar: looks like white sugar but it's more tan in color. This is not whitened through bone char and considerably less processed than white sugar. demerara sugar: sugar cane juice that is centrifuged to make nice big crystals. It has more molasses than unrefined cane sugar. rapadura & sucanat: both dehydrated, powdered forms of unrefined sugar cane juice, containing all the molasses and sugar. I'm not entirely clear on how different these two are from each other and am still experimenting. blackstrap molasses: this is the gooey black/brown stuff that is left when the sugar cane solids are separated from it. organic brown sugar: unrefined cane sugar with some of the molasses mixed back into it. RECIPE MODIFICATION: I decided to make two batches. One batch would be "sweeter" -- and I used organic/vegan brown sugar. The other would be more "savory" with onions, more garlic, chili flakes and demerara sugar and a small amount of blackstrap molasses. As I mentioned, I originally mostly followed a chutney recipe from Laura Colwin's cookbook. This time, I made a lot of changes. First of all -- I was working with a lot more lemons. I quadrupled the recipe and then halved it. After prepping 32 lemons, I realized I didn't have enough lemons left over to make 2 cups of additional lemon juice, so I went up to my friend Regan's house and picked another sack of lemons. This was a bit more work -- I zested the lemons before juicing them, grabbed any loose bits of pulp from the lemons and the juicer, and also saved the seeds to add to the chutney in cheesecloth later. Lemons, pt 1: Zest, supreme and section 32 lemons, reserving the seeds and discarding all pith and membrane. Finely mince zest, and add with lemon pulp into glass or earthenware container (my grandmother's Hull beanpot works great for this, you might use a tagine or Pyrex covered dish) with 8 T of sea salt. Let sit overnight. The lemon pulp will release plenty of juice! Lemons, pt 2: Zest, halve and juice enough lemons to get 2 cups of lemon juice (in my case, this was 15 of Regan's lemons -- many didn't have seeds, so I think they were a bit underripe but still tasted plenty lemony). Reserve the seeds with the other seeds and divide the zest into two equal portions. 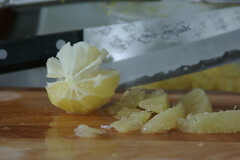 The next day, strain the salty lemon pulp and zest, reserving the liquid. Divide evenly by weight using a kitchen scale (this was 3# of pulp and zest in my case, with 2.5 c of juice), and put into two separate pots. 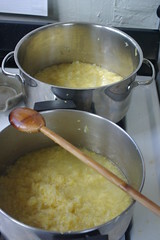 Divide reserved juice evenly by volume into the two pots, as well as the reserved extra zest. The spices are pretty labor intensive -- if you haven't bought hulled cardamom, put the green cardamom pods into your mortar/pestle and bust them open until you have enough. Toast the spices -- except the cayenne (believe me - you don't want to breathe that in!). Once they toast and the coriander starts popping, put them in your mortar & pestle and grind as finely as you can, or put into a spice mill/coffee grinder. Cook everything for 60 minutes or so until it reaches the right consistency. Remove cheesecloth with lemon seeds. Let sit overnight. 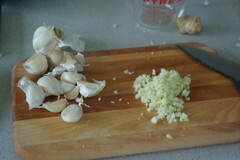 Taste, make any corrections (additional lemon juice, more ginger or chili, for example). Heat up, taste again, when satisfied, put into clean, hot mason jars and hot water bath can. I have to admit -- the sweet(er) version surprised me. The chopped figs really thickened up the chutney and it is very fruity and yet very lemony. The savory version definitely has a kick to it. The sweeter version is much darker in color (the figs and dates, to be sure). Both are pretty darned tasty. PEACHES: I managed to cook down the peaches and have a full half gallon jug and a 2/3 half gallon jug of the juice, and a big pot of fruit. I'm letting it cool so I can make jam and jelly tomorrow while canning the chutney. Apricots are still in the refrigerator. My brother visited and brought Indian food this evening. I'm hopeful that he'll come over and help me tomorrow night by assembling the pieces for the solar dehydrator. He knows how to straighten slightly warped 1" x 2" pieces! He was taking pictures of my stacks of jars of jelly and inside my refrigerator for "proof" that I'm turning into Grandma Clark.